The hallmark of any great relaxation room is either a quality couch, an equally good armchair, or both. But why would we need a 3 seater when one of the main reasons we build our dens is to get away from it all and enjoy some peace? Imagine what your buddies would say when you’re lounging in luxury while they’re standing around. Picture stretching out your legs without them dangling off the end. Settees/couches/sofas are the answer. Here are our top picks from various categories as well as advice on what to buy and how to care for your new piece of furniture. It doesn’t take much guesswork to figure out what these are. Sectional/segmental sofas are an excellent choice a den. They are space savers in that you can switch out specific segments when needed (without feeling you have half a piece of furniture leftover); they often use top quality upholstery and manufacturing techniques since a lot of more is exposed to the elements as well as being moved around (poorly built seats would fall apart in the same conditions), and they can be ships in multiple boxes. No more back-breaking lifts up apartment stairs! Most will be L-shaped (or V-shaped if you look at them from another angle) but we’ve seen a few that are 5+ segments in a line and even circular. If you can think it, modularity can achieve it. A great 2 piece sectional with an overall traditional look - one being the main segment which can fit 4 people, and the other being a smaller segment without a backrest. Look at the right side by itself and it looks exactly like a partial-backed chaise lounge. The charcoal gray version pictured above is our personal favorite, but it also comes in walnut brown if that’s more your taste. Everything from the microfiber fabric to the clean stitchwork looks and feels top-of-the-line. You’ll have a hard time deciding whether or not to use a cover. On one hand, using a cover protects it from stains and everyday use. On the other hand, you don’t get to enjoy the awesome aesthetics. You may notice that the shipping weight is double the item weight. That’s thanks to it coming in two segments in ginormous boxes which are great for keeping it dink-free but bad if you live on the 3rd story. Overall, this could be the ultimate L-shape settee providing you have the funds and an empty corner in your room. Though having similar dimensions to the previous item, this open end sectional is a bit cheaper and also comes with a matching ottoman. It has bonded leather upholstery with nailhead pins holding everything together and giving a nice accent to the whole piece. Bonded leather doesn’t get enough credit. No, it doesn’t stand up to the real stuff, but it is almost as strong, lasts for years, is easy to maintain, and makes having a solid couch all the more affordable. Props to the bond! The seat cushions have innersprings hidden away in a bulk of foam - resulting in supreme comfort. The only real assembly is in pinning the main pieces together. Bonus cushions are included but be warned: they are strangely firm and don’t seem to get better with time. By cushions separately if you have to. The ottoman is the same height as the seats. Position it correctly and you’ll ample leg room. Daybed, convertible couch, pull out sleeper, futon - there are several terms for what is essentially a piece of furniture for sleeping and for seating. Needing to sleep in your man cave may not have crossed your mind, but when that time inevitably comes, having one sure beats sleeping on the ground with only a foam mattress between you and the hardwood floor. End of a massive night and have a friend with no chance of getting home safely? Bed-mode. Work in the morning but need to watch the final episode of the season? Bed-mode. Master bedroom infested with bedbugs? Be… Okay, I’m stretching now, but you get the point. This cheap chaise convertible has an immaculate modern design coupled with smart material choices. Half and half mode (pictured above). A secondary piece, of what I can only describe as an oversized ottoman, slots in the gap to create a rectangle. The backrest is still up. Full bed mode. The back collapses down by pulling the seat towards you. Its multiple chrome-like legs provide all the support you need while still being minimalistic (and check out those angled legs on the ends!). If you’ve slept on a mate’s sofa before, you can attest to the pain of trying to find a comfortable position between the crevasses. The difference with pull out beds is that you have to find a position on a large tic-tac-toe grid. Luckily, this one has small enough gaps - saving you from a sore neck and lack of sleep. Note: Despite the image making it out to look white/ivory, in reality, I would say it is a darker white/cream color. Thanks, natural lighting. I’ll save you from an obligatory Christmas joke about reindeer coming separately and just get into the features. This hide-a-bed’s (just another name for a convertible sleeper) thin armrests maximizes seating space. It definitely trumps 2 seaters with thick armrests if you have a small den since you can lie down flat. 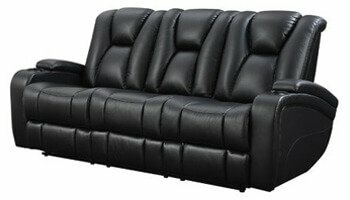 The tufted back has a bit more padding but not enough to lean on comfortably. It requires you to sit with perfect posture, so make sure to grab a couple throw pillows at the same time. A seat pad isn’t included so you’ll need to also buy an 8” twin/single mattress (few inches smaller than the dimensions above). Despite coming across as a negative, it will mean you can splurge on memory foam and create the ultimate seating experience. The trundle pulls out to become another bed, but we would rather have it as extra storage space (great for blankets, games, and emergency flask). See Current Price No, it isn’t a traditional sofa. No, it doesn’t have cup holders, adjustable headrests, or a wooden frame. But it does fit the bill for certain guys out there. This three-fold foam mattress is perfect for utilizing space and being a backup seat/bed. Both the high-density foam and stitchwork are incredibly durable and well made. Seating mode during the day, sleeping mode during the night, and closet mode any other time. Whether you have a recently renovated house and want your den to match, or you prefer the new over the old, modern furniture is the way to go. The style generally consists of smooth upholstery & metal/plywood combinations, and a minimalistic approach to design, but also includes black leather upholstery and thick pillow padding. Basically, if it looks new, it’s modern. This Bissette 3 seater recliner has the gadgets, the looks, the quality, and all the comfort one needs in a den. The cushions are unremovable so be mindful when holding drinks or eating snacks since that which falls into the gaps are hard to remove. Make sure you have a couple inches clearance between it and your wall since it angles back when reclined. From the mid-century all the way up to the 20th century, contemporary furniture is a safe bet for most man cave themes. Bold choices of materials, classy looking tufts, quality bases - it’s no wonder manufacturers continue to produce them. There’s something about the mid-century contemporary design that screams class. See someone lounging in this and you’d assume they have life figured out (or is it just me?). This Chesterfield piece spans only 86” long manages to fit 3 seats and two scroll armrests. The matching button tufts throughout and low height only add to its cool looks. The only assembly required is screwing the dark wood legs in. In doing so, put towels on the ground before rolling over! Note: There are reports of it being on the firmer side. That should resolve itself after a couple weeks of use. The reclining armchair is by far the most popular item requested, so it’s only appropriate that we have a dedicated section for its big brother. However, since the reclining mechanism adds more room for error, knowing what to look for is imperative. While not sporting all the fancy gadgets, this has all the fundamentals ticked. Easy to maintain bonded leather? Tick. Generously thick padding? Check. Reliable lever-controlled reclining mechanism? Mhm. At 90” long, it provides ample space to spread out and relax without the big dips between seats. The rolled armrests and low enough to use as a pillow and the reclining motion below seems to glide up and down. Keep in mind that all three sections individually recline. Other items in the collection include a standard reclining armchair and 2 seater (with center console), as well as power-reclining variations of each type. Two colors: Black (pictured) and chestnut brown. We all know the importance of saving space, and the number one best way to do that is with inflatable loungers. They are rarely the main place to sit in a room but are perfect for when your guy friends come over or you want to experience that movie a bit closer to the screen. As of recently, they someone pack down to the size of a swimming bag. It could be advances in material making; it could be improved product design, or it could be magic. No matter the reason, there’s now no reason to not have one stored in your closet. Starting in the Netherlands, this air-filled creation has spread to all corners of the globe. And we’re not surprised - they’re simple, ingenious, and accessible. Dozens of brands have their own versions, but we’ve bought from a few different vendors and ChillaX stands above them all. As with the three-fold foam sofa previously mentioned, this is a must-have item for when friends come over and you’re all out of chairs. Tried drinking on a pocket of air? It’s pretty cool! Much like in politics, the majority of furniture buyers will be on opposite ends of the spectrum, with the remainder being in the middle. Whether it’s because they’ve always done it that way, have had a poor experience, or have calculated the risk, buying new vs used comes down to each individual’s situation. Note: Online is increasingly becoming a more desirable method to buy furniture. Shipping times are decreasing, image/videos show you exactly what you’ll get, and costs are similar to standard brick and mortar stores. Spraying on a light coating is an easy and affordable way to keep it clean. For leather (premium and bonded), we highly recommend Weiman’s Cleaner & Conditioner Spray. It significantly slows the aging process of leather, thanks in part to reducing the effects of the sun's rays and using a pH neutral formula. Better yet, you can also use it on clothing, bags, shoes, and car seats. There are spray bottles for all types of fabric and material. See this guide for cleaning fabric upholstery. Yes, your standard household vacuum will work, but it’s a hassle to use, especially if just for a piece of furniture. With hand held vacuums (we recommend Bissell’s Hand Held Corded Vacuum), there’s no excuse to not clean lint, hair, spills, and crumbs - even if only periodically. Get one with a rubber or brush nozzle. The metal ends are notorious for scratching if pushed too hard. The downside of covering an aesthetically pleasing settee is outweighed by the upside of protecting it from the elements. Some are made to cover specific shapes, but you can get away with a generic piece of fabric. Have it on 24/7 or just for when your boisterous buddies are over. Take it outside and shake it about. Throw it in the washing machine. Simple. Pretty self-explanatory - spring is the ideal time to do a proper clean. Get in all the nooks and crannies and, hey, you never know what cool things you’ll find.